How is your retaining wall holding up? Yards come in all shapes and sizes and often times a retaining wall is what's needed to control the movement of soil and water flow. 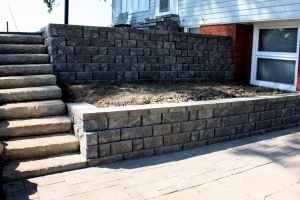 A retaining wall, if properly planned and constructed, can accomplish all that and can beautify your property too! Retaining walls have to do a lot of work and over time they can begin to slip. Not only does a retaining wall have to hold up its own weight, but it has to hold up the weight and movement of the soil and water pressing against it. If you have a retaining wall that isn't holding up, it might be due to improper construction. Beemer Landscaping can survey your property and give you a professional analysis on what a retaining wall can do for your property and home foundation. We use natural stone, boulder or modular block in the construction of all of our retaining walls. We service the entire Central Iowa area so contact us for a free quote or fill out our Landscaping Project Questionnaire.